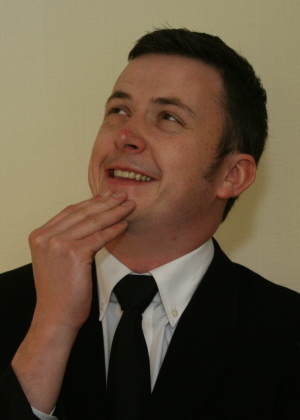 Paul Savage started out on his comedy journey in Dec 2006 by unusual means. Having only heard the phrase open mike in the context of comedy, Savage took to the stage of a club in Moseley and started his tirade against Dido, and wove in a story of webcam fraud, unaware that open mike is also used in music terms, and he was essentially crashing an acoustic guitar night. He has never used either of those pieces of material again. He started off in "proper" comedy when his bottle returned 4 months later in March 2007 with some gong shows. Since then he has performed across great swathes of Britain, from his base in Wolverhampton. Never one to do something the easy way, for his first two years he mostly avoided the comedy metropolises such as Manchester, London and Edinburgh, instead playing such places as Marsh Gibbon (pop 991). Now on the road properly and gigging everywhere, he drives a Golf mark III in blue called “The Slim Charles appreciation Society”, and is happy to carshare with other acts. He has done paid work (20’s, 15, and MCing) for Off The Kerb, Mirth Control, Funhouse Comedy, Kill for a seat, Just Fair Laughs, Alan Anderson’s Haha Comedy, Agraman/Buzz comedy, Laughing factory, Hilarity bites, Funnybones and Hilarious. He is a great MC, warm and welcoming, and able to bring an atmosphere. As such, he is Resident MC at Off the Kerb’s Staffordshire Uni gig, at Speakeasy’s Wolverhampton uni gig, and Resident MC for corporate work for Ramada Inns (he’s the best corporate compere we’ve ever had- Ramada). His style of Comedy is a mixed bag of confessional, whimsy, wordplay and ranting. Most of it is true. He doesn’t yet have a catchphrase, the closest he comes is the phrase “that, tragically, is a true story”. He once impressed a girl at a gig so much she called off her engagement and stalked him for a bit, sending him naughty photos. She has now moved back to Poland, and he can breathe easily again. That, tragically, is a true story. Savage is happy to gig almost anywhere (he’s performed at Britain’s oldest pub, York’s most haunted pub, Europe’s largest paintball game, the Nottingham Real Ale festival and the Special Olympics) and with anything (he’s been on bills with bands, strippers, contortionists, magicians, burlesque artists, acrobats and a fat scottish bloke breaking the world record for eating paintballs). He has an immensely versatile set, and has done completely clean 15 minute sets for church and youth audiences. Juice Comedy clubs performer of the year 2009. West Midlands Comedy Forum Most improved act 2009. Has won a spiky mike gongshow. Beat the frog on his first attempt. He has his own podcast with fellow comic Pete Smith called “Peas in a podcast” (psinapodcast.podbean.com). It has a cult following. he has appeared on Radio as a guest talking about comedy on BRMB, Kerrang and Galaxy, Radio 4 show Dave Gorman's genius (as a contestant), on the channel4 website 4talent, and in the leeds student paper in an article on how to become a standup. In Oct 2007, after being booked to play a pub in Bridgnorth, he rang the promoter to check it was still on and was told that he no longer wanted it, and it was his problem now. Savage was left 5 days to book an entire night from scratch. He put on a night of such quality, and compered so finely, that the entire pub gave a standing ovation. He is aware that will probably never happen again. That venture, soon named The Speakeasy, grew into various venues, and now resides at Wolverhampton University. The name came up whilst scouting premises in Wolverhampton, he was recommended a backstreet pub that put on illicit music nights after licensed hours. To test their capacity for live comedy, he got on the mike after a reggae band, and went for a big opening. He received his first ever genuine death threat during his first joke, and discounted that alehouse as welcoming towards comedy. Clearly he hadn’t learnt from his first ever gig. Still, he got a good name for the club, so every cloud. The Speakeasy clubs are generally well regarded as some of the friendliest nights on the circuit for up and coming acts. Savage pays every act that performs. He MCs most of the time.